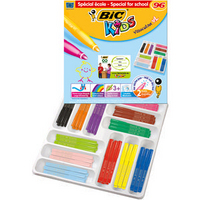 This bumper pack of Bic Kids Visa XL Felt Pens (887839) features a chunky grip great for children 3 and up. These pens are carefully designed with children in mind for safe and clean use. Stained clothes aren't a problem: the water-based ink can be washed out of most fabrics. The nib won't dry out, even if the cap's left off for three months, and it's designed to withstand blunt force from heavy-handed youngsters. The cap is ventilated as well for extra safety.•Extra large Bic felt pens with chunky grip and 4.5 mm tip•Water-based ink: washable on most fabrics•Will not dry out for up to 3 months without cap•Wide range of 24 vibrant colours•Tip resists 4 kg of force to prevent damage•Ventilated cap for child safety: European Standard-compliant•Nib Size: 4.5mm•Supplied in a pack of 96 Approx Dimensions (CM): D36.3 W36.3 H4.3. Approx Weight (KG):1.364.